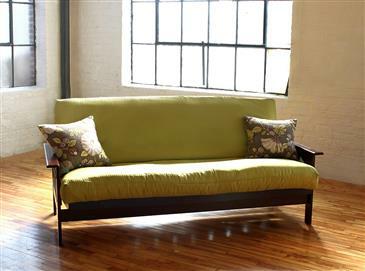 Green Cotton Boulder futon without Fire Retardant - This futon is the firmest we make! Flame retardant: None - You will need to send us a Doctor's Prescription to get this futon, or you can get your futon in our DREAMTON style wrapped in a layer of pure wool, which acts as the natural flame retardant. After you purchase this futon, please fax, mail, or email a copy of a prescription from your medical doctor, we cannot ship your mattress until we receive the prescription. The note must say something to the effect of: "My patient requires a chemical free futon." It contains about 15% more cotton and twice as many tufts than our standard Green Cotton futon. Made of 100% Green Cotton. The Boulder Cotton is hand made in the same style as the firm futon that have been made for centuries in India and Japan. We recommend this mattress to be used with: platform beds or box-springs. Not always recommended to be used with bi-fold or tri-fold frames.